In 1844, Samuel Morse transmitted his famous telegraph: "What hath God wrought?" Quoting from the Book of Numbers, he predicted the profound influence of his accomplishment. Similar technological revelations are depicted in cinema, perhaps none as memorable as Colin Clive's manic cry from the 1931 Frankenstein: "It's alive!" 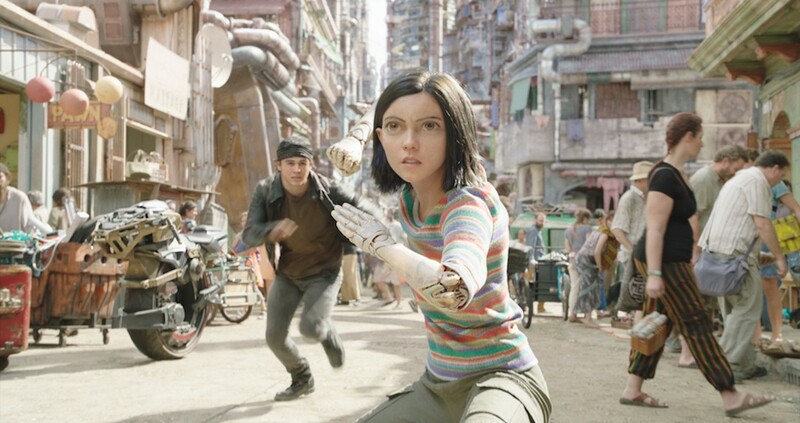 Fast-forward 88 years to writer-producer James Cameron and writer-director Robert Rodriguez, who have taken the creepy but irresistible art of human creation – via performance-capture technology – to a different level in Alita: Battle Angel. Yet Cameron and Rodriguez's achievement is more akin to Marty Feldman's "Abby Normal" brain from Young Frankenstein than anything Morse or Mary Shelley attained. The new sci-fi action film introduces movie audiences to a world and a character that fans of Yukito Kishiro's graphic novels have long cherished: post-apocalyptic Iron City and the eponymous Alita. It's the year 2563, three centuries after "the fall," and Alita (a "total replacement cyborg") is brought back to life by Dr. Dyson Ido (Christoph Waltz), who is still reeling from the death of his own human daughter. In this violent world, everyone is obsessed either with playing a roller-derby rip-off called "motorball" or – in a blatantly spiritual reference – ascending to the "great sky city." Amid this chaos, Alita, Dyson, Dyson's ex-wife (Jennifer Connelly) and Alita's requisite love interest (Keean Johnson) must discover their true selves while, predictably, battling a villain (Mahershala Ali) who isn't really the villain. One of the many elements this cyberpunk adventure hurls at the screen with little explanation or import is a bar called Kansas. Popular among the "hunter-warriors," the hangout holds meaning for fans of Kishiro's manga but will be lost on everyone else. To add context, I almost expected Cameron to regurgitate "You're not in Kansas anymore" from The Wizard of Oz, as he did to cringe-worthy effect in Avatar. Well, guys, I'm actually from Kansas, and while your film has a lot of courage and some heart, it's sans a brain. The other performances are mediocre, even wooden. It's not that Waltz, Ali and Connelly are particularly miscast, but they have all done finer work more suited to their talents and sensibilities. And speaking of sensibility, that's the film's downfall, as Rodriguez lacks artistic discernment. (His string of entertaining but low-brow films, from Sin City to Planet Terror, illustrates that.) He does deserve credit, though, for what he admits is a stylistic and thematic departure for him, but, frankly, Cameron should have helmed this himself. Nevertheless, Alita will find its audience. It's too early to tell whether crowds will be enthusiastic enough to support multiple sequels, which are clearly what Cameron has in mind. But standing alone, this first installment is too underdeveloped, derivative and poorly scripted for adults, and too violent and adult-oriented for children. It's a waste of technology. "Does it bother you that I'm not completely human?" Alita asks. No, what bothers me is the rest of the film.